of business failure? 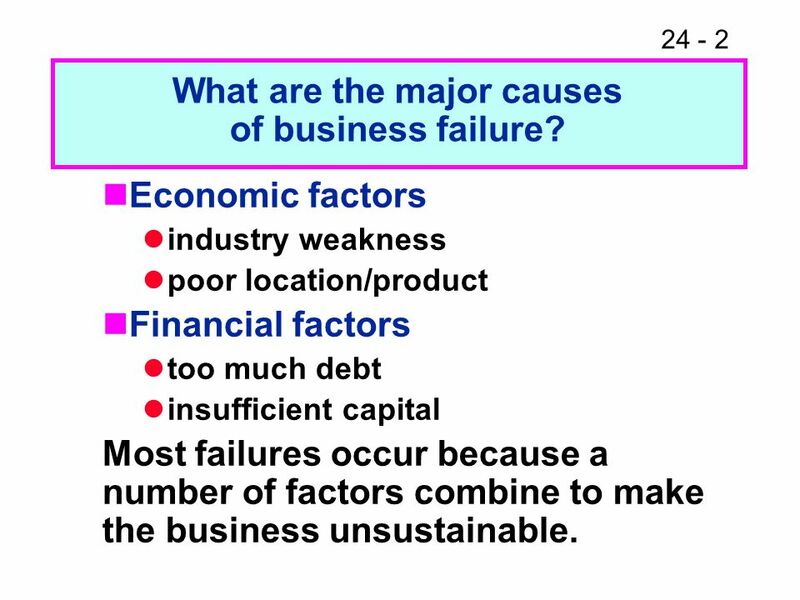 Economic factors industry weakness poor location/product Financial factors too much debt insufficient capital Most failures occur because a number of factors combine to make the business unsustainable. 3 Do business failures occur evenly over time? A large number of businesses fail each year, but the number in any one year has never been a large percentage of the total business population. The failure rate of businesses has tended to fluctuate with the state of the economy. 4 What size firm, large or small, is more prone to business failure? 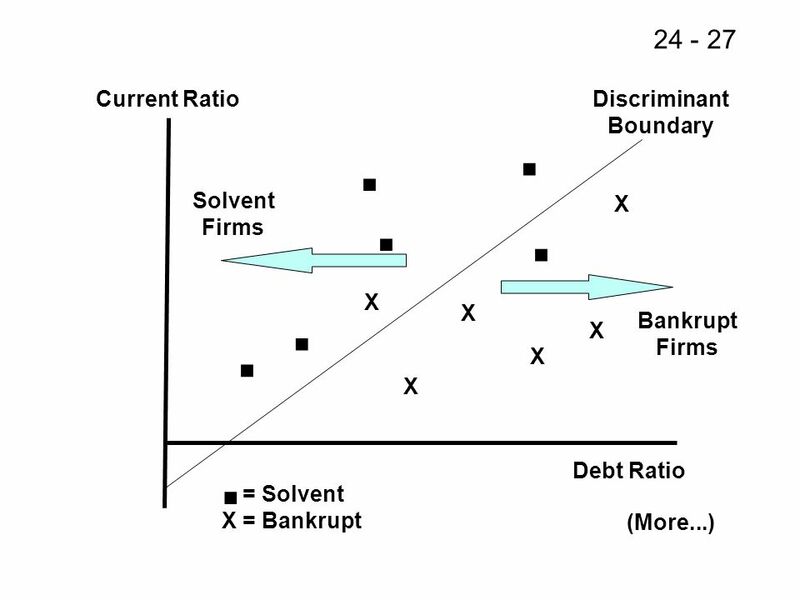 Bankruptcy is more frequent among smaller firms. Large firms tend to get more help from external sources to avoid bankruptcy, given their greater impact on the economy. 5 What key issues must managers face in the financial distress process? 6 Should the firm file for bankruptcy, or should it try to use informal procedures? Who would control the firm during liquidation or reorganization? 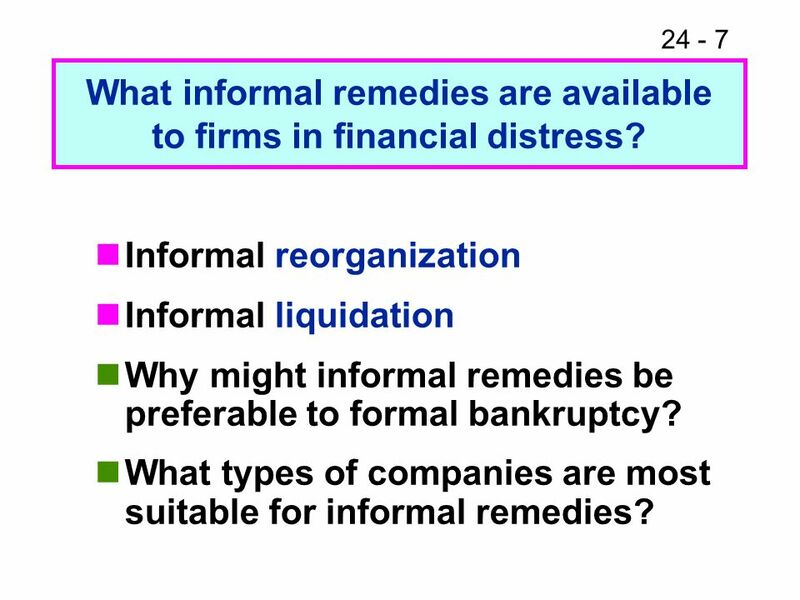 7 What informal remedies are available to firms in financial distress? 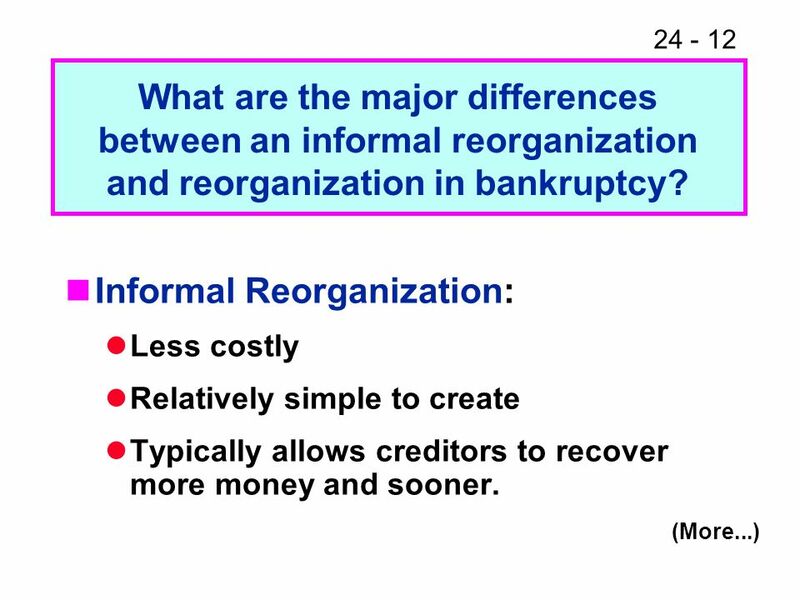 Informal reorganization Informal liquidation Why might informal remedies be preferable to formal bankruptcy? What types of companies are most suitable for informal remedies? 9 Composition: Creditors voluntarily reduce their fixed claims on the debtor by either accepting a lower principal amount or accepting equity in lieu of debt repayment. 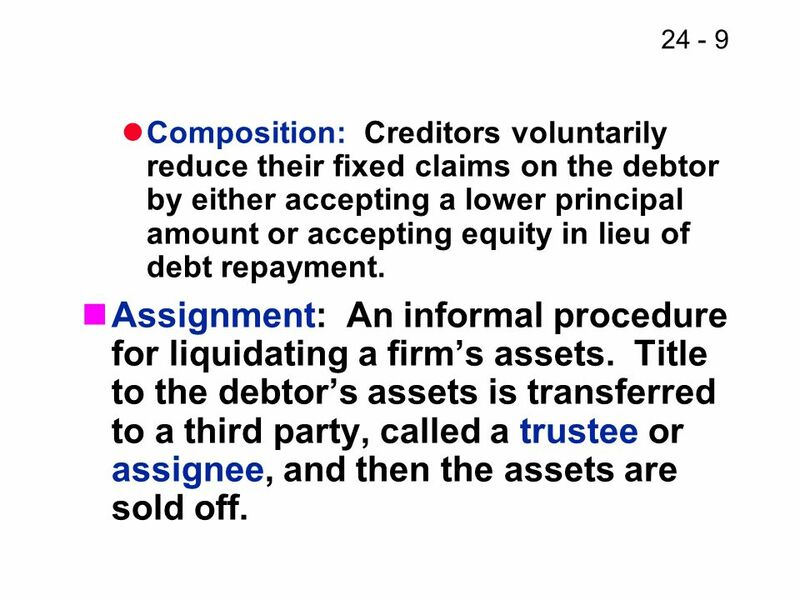 Assignment: An informal procedure for liquidating a firm’s assets. Title to the debtor’s assets is transferred to a third party, called a trustee or assignee, and then the assets are sold off. 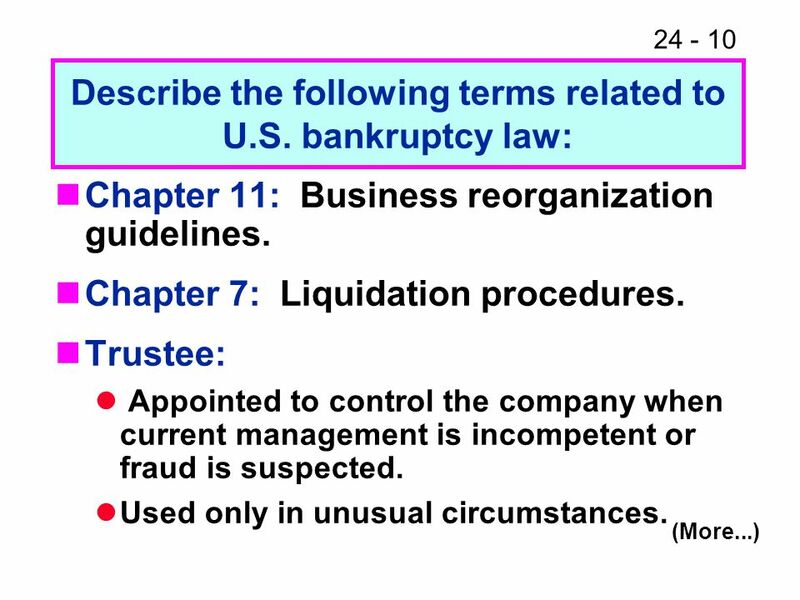 11 Voluntary bankruptcy: A bankruptcy petition filed in federal court by the distressed firm’s management. 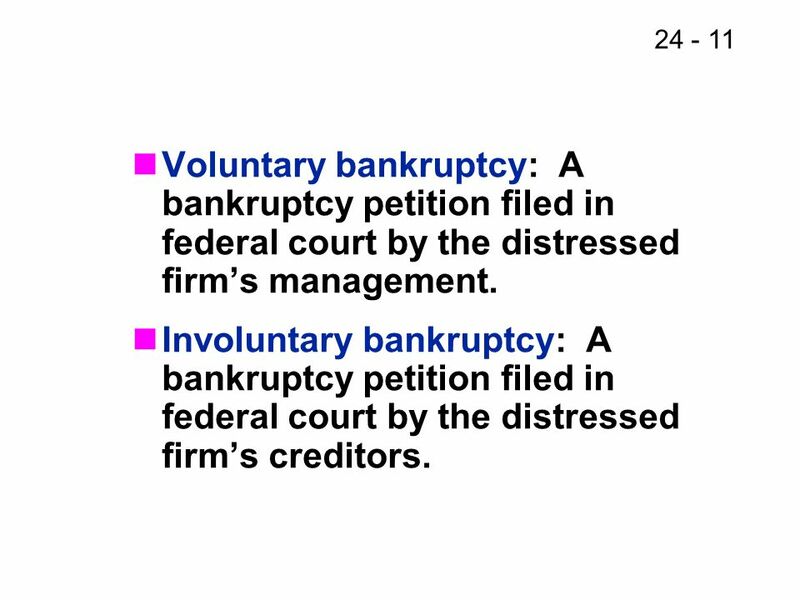 Involuntary bankruptcy: A bankruptcy petition filed in federal court by the distressed firm’s creditors. 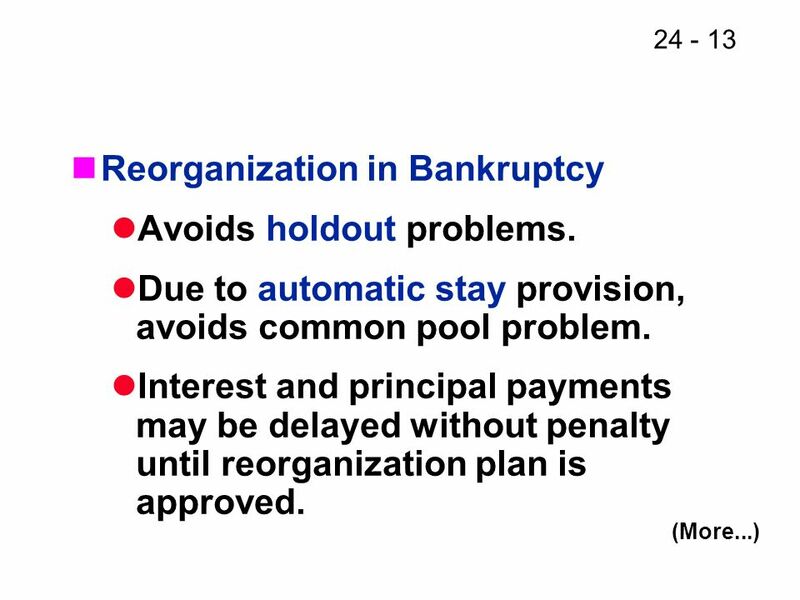 13 Reorganization in Bankruptcy Avoids holdout problems. 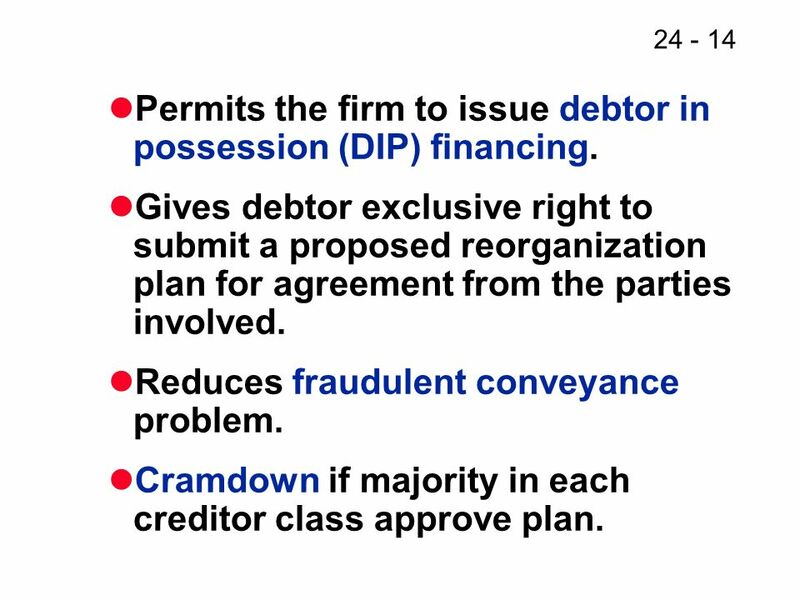 14 Permits the firm to issue debtor in possession (DIP) financing. Gives debtor exclusive right to submit a proposed reorganization plan for agreement from the parties involved. Reduces fraudulent conveyance problem. Cramdown if majority in each creditor class approve plan. 15 What is a prepackaged bankruptcy? New type of reorganization Combines the advantages of both formal and informal reorganizations. Avoids holdout problems Preserves creditors’ claims Favorable tax treatment. Agreement to plan obtained from creditors prior to filing for bankruptcy. Plan filed with bankruptcy petition. 17 Unpaid contributions to employee benefit plans that should have been paid within 6 months prior to filing. Unsecured claims for customer deposits. Taxes due. Unfunded pension plan liabilities. General (unsecured) creditors. Preferred stockholders. Common stockholders. 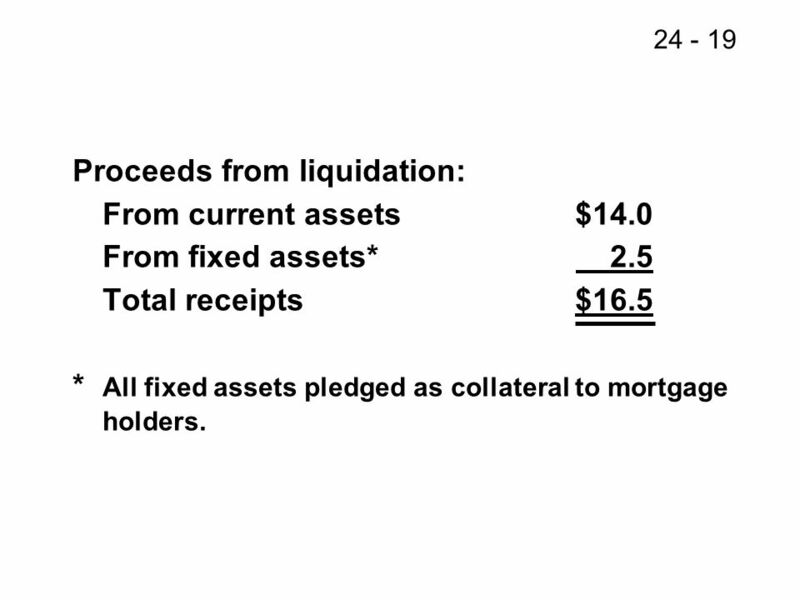 From current assets	$14.0 From fixed assets* Total receipts	$16.5 *	All fixed assets pledged as collateral to mortgage holders. Creditor Claim	Distribution	Unsatisfied Accrued wages	$0.3	$0.3	$0.0 Federal taxes Other taxes First mortgage Second mortgage $4.5	$3.5	$1.0 Notes:	(1)	First mortgage receives entire proceeds from sale of fixed assets, leaving $0 for the second mortgage. (2)	$ $3.5 = $13.0 remains for distribution to general creditors. 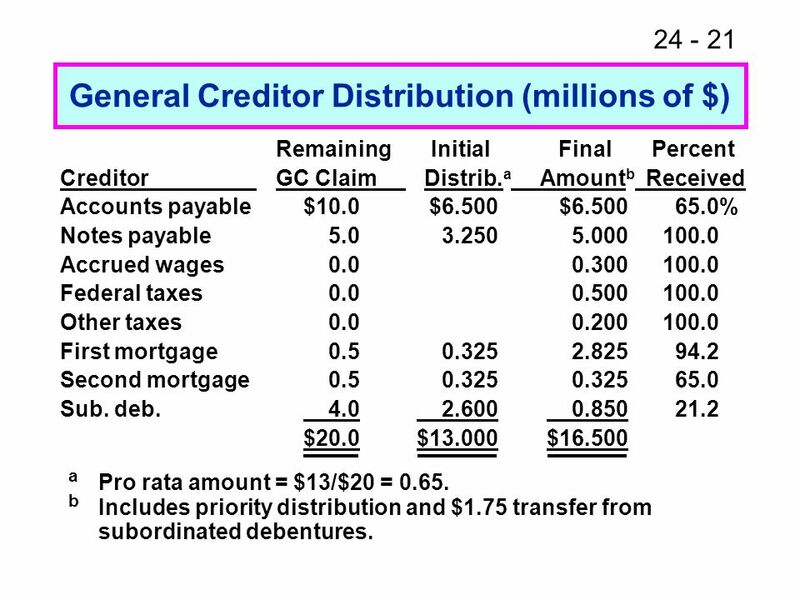 Remaining	Initial	Final	Percent Creditor GC Claim	Distrib.a	Amountb	Received Accounts payable	$10.0	$ $ % Notes payable Accrued wages Federal taxes Other taxes First mortgage Second mortgage Sub. deb $20.0	$ $16.500 a	Pro rata amount = $13/$20 = 0.65. b	Includes priority distribution and $1.75 transfer from subordinated debentures. 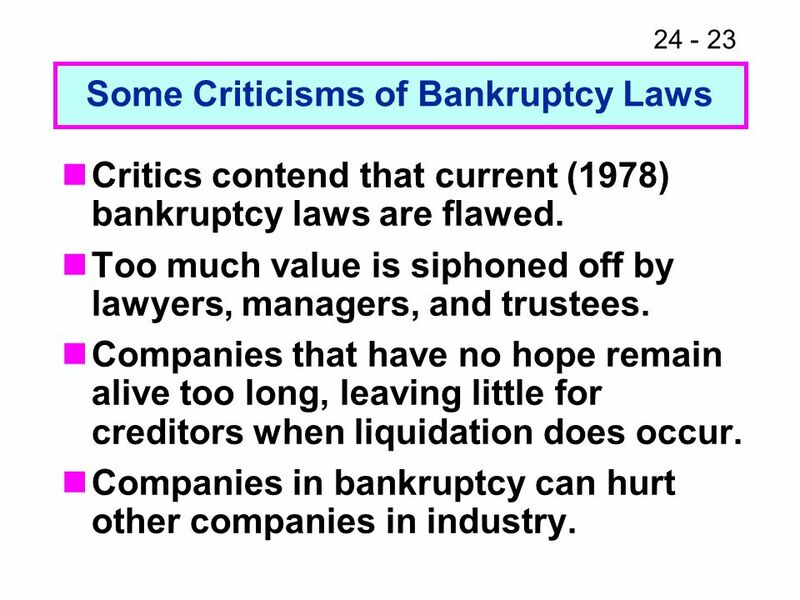 Critics contend that current (1978) bankruptcy laws are flawed. Too much value is siphoned off by lawyers, managers, and trustees. 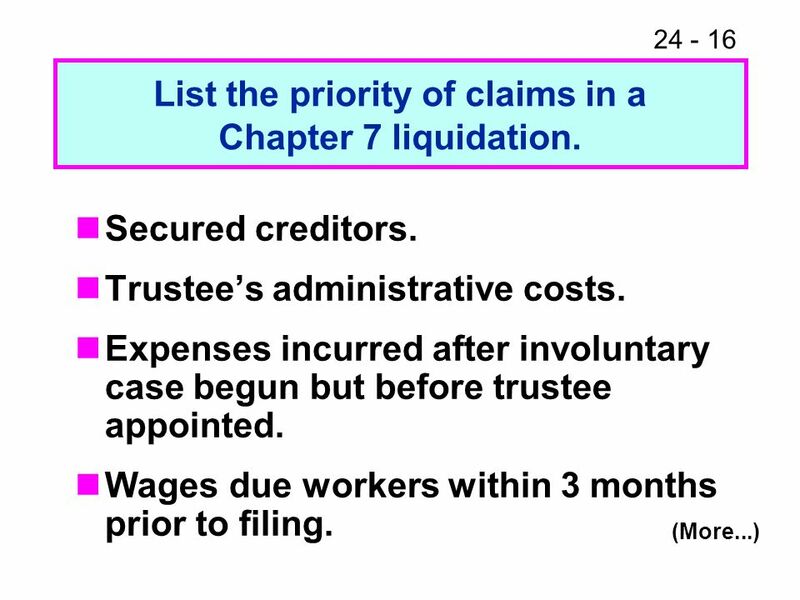 Companies that have no hope remain alive too long, leaving little for creditors when liquidation does occur. Companies in bankruptcy can hurt other companies in industry. 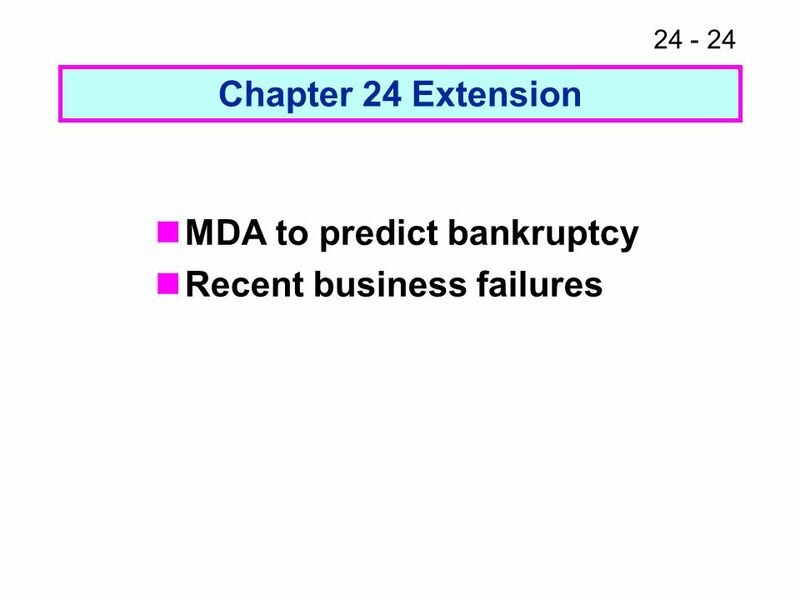 25 What is MDA, and how can it be used to predict bankruptcy? Multiple discriminant analysis (MDA) is a statistical technique similar to multiple regression. It identifies the characteristics of firms that went bankrupt in the past. 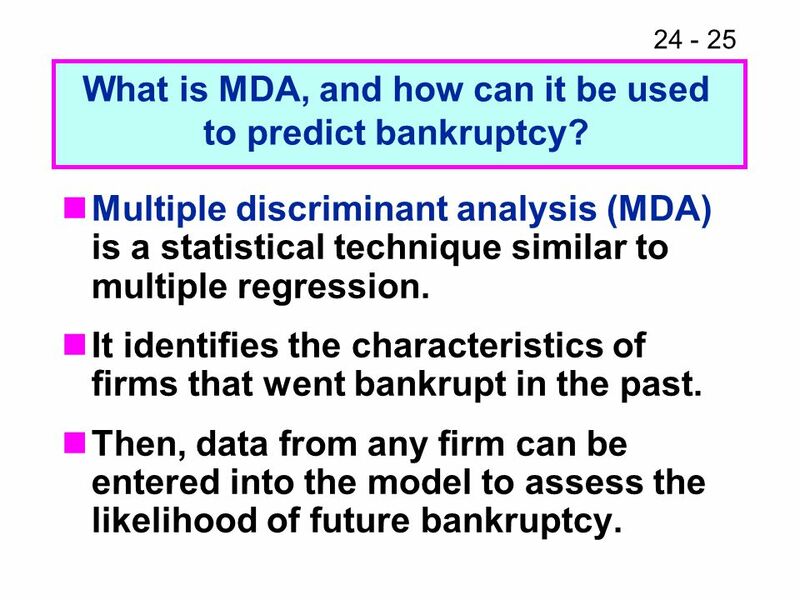 Then, data from any firm can be entered into the model to assess the likelihood of future bankruptcy. 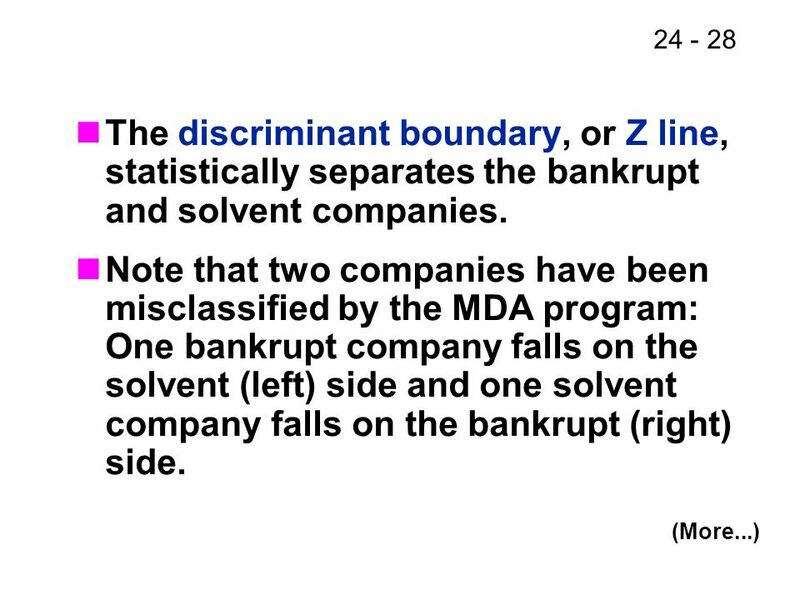 28 The discriminant boundary, or Z line, statistically separates the bankrupt and solvent companies. 29 Z = -2 + 1.5(Current ratio) - 5.0(Debt ratio). 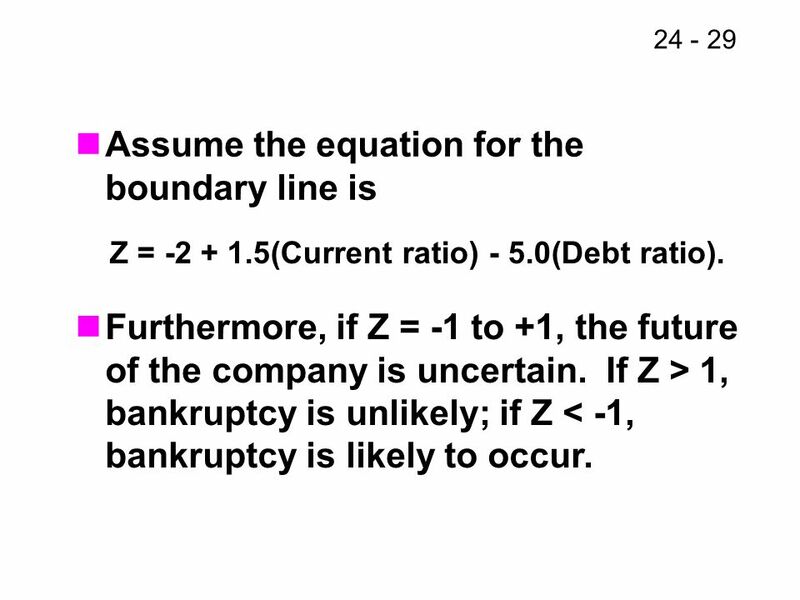 Assume the equation for the boundary line is Z = (Current ratio) - 5.0(Debt ratio). Furthermore, if Z = -1 to +1, the future of the company is uncertain. 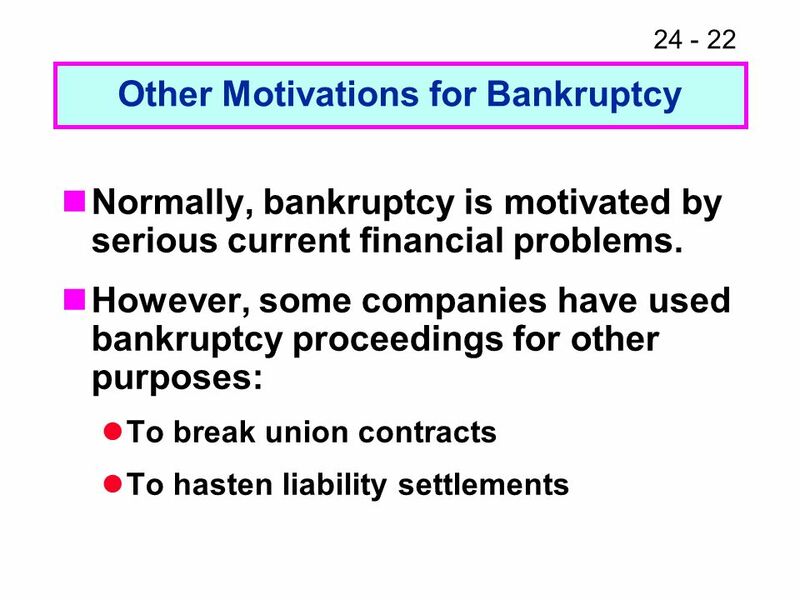 If Z > 1, bankruptcy is unlikely; if Z < -1, bankruptcy is likely to occur. Suppose Firm S has CR = 4.0 and DR = Then, Z = (4.0) - 5.0(0.40) = +2.0, and firm is unlikely to go bankrupt. 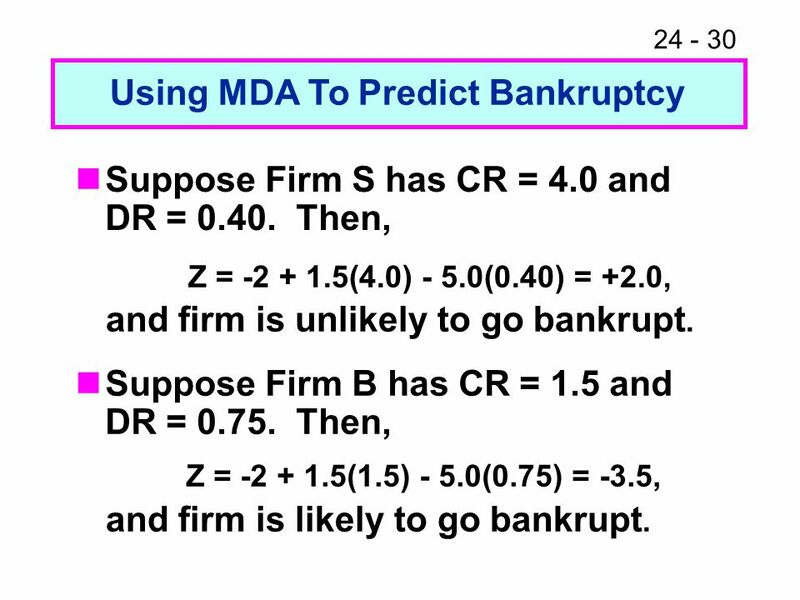 Suppose Firm B has CR = 1.5 and DR = Then, Z = (1.5) - 5.0(0.75) = -3.5, and firm is likely to go bankrupt. 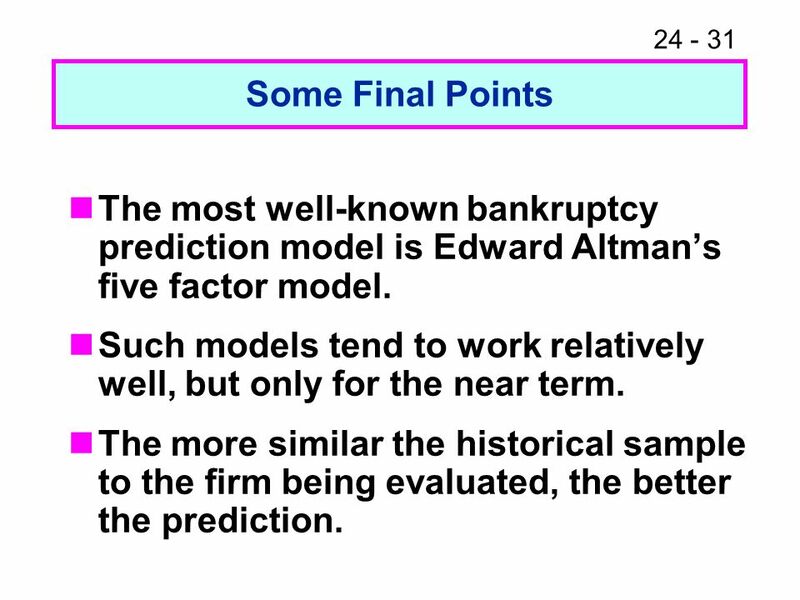 31 Some Final Points The most well-known bankruptcy prediction model is Edward Altman’s five factor model. Such models tend to work relatively well, but only for the near term. The more similar the historical sample to the firm being evaluated, the better the prediction. ©2003 Prentice Hall Business Publishing, Auditing and Assurance Services 9/e, Arens/Elder/Beasley Audit of the Capital Acquisition and Repayment. Proprietorships, Partnerships, and Corporations Acct 2210: Chp 11 McGraw-Hill/Irwin Copyright © 2013 by The McGraw-Hill Companies, Inc. All rights reserved. McGraw-Hill/Irwin© 2008 The McGraw-Hill Companies, Inc. All rights reserved. 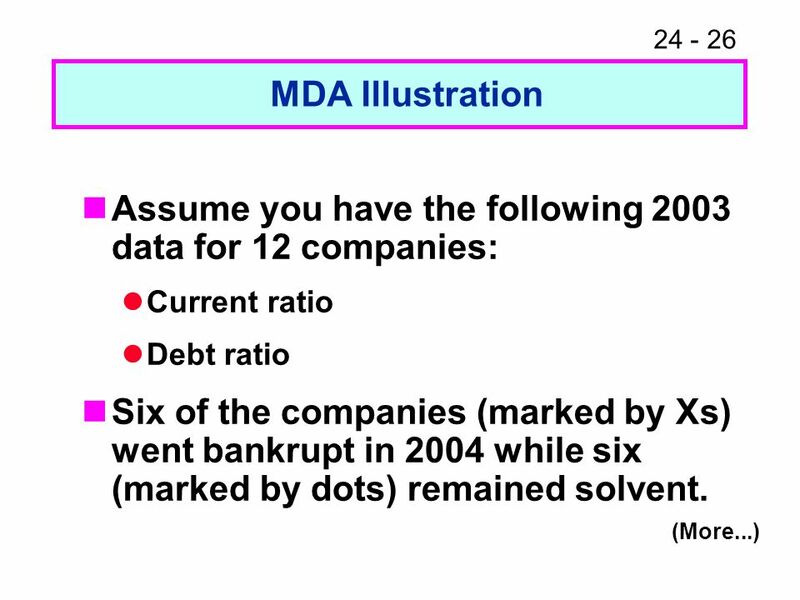 20 Corporations in financial Difficulty. 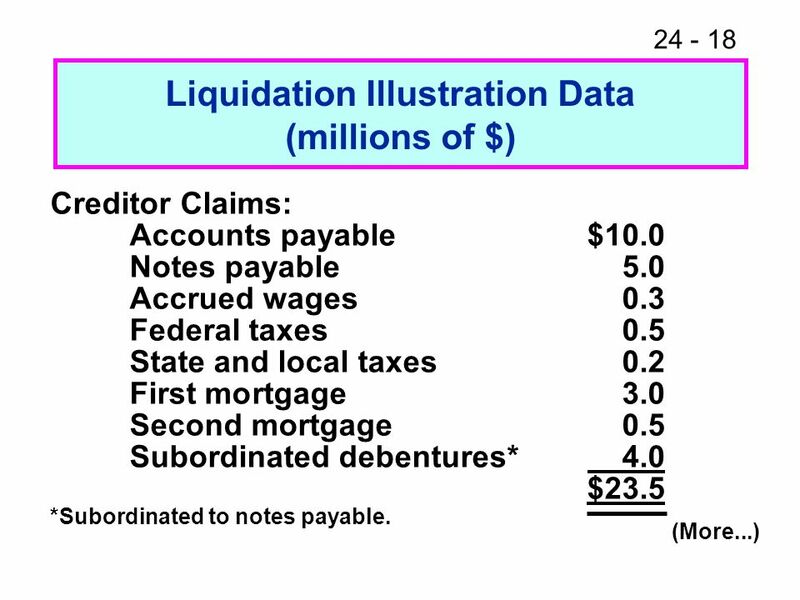 McGraw-Hill /Irwin© 2009 The McGraw-Hill Companies, Inc. CURRENT LIABILITIES AND CONTINGENCIES Chapter 13. McGraw-Hill/Irwin© 2008 The McGraw-Hill Companies, Inc. All rights reserved. 16 Partnerships: Liquidation. 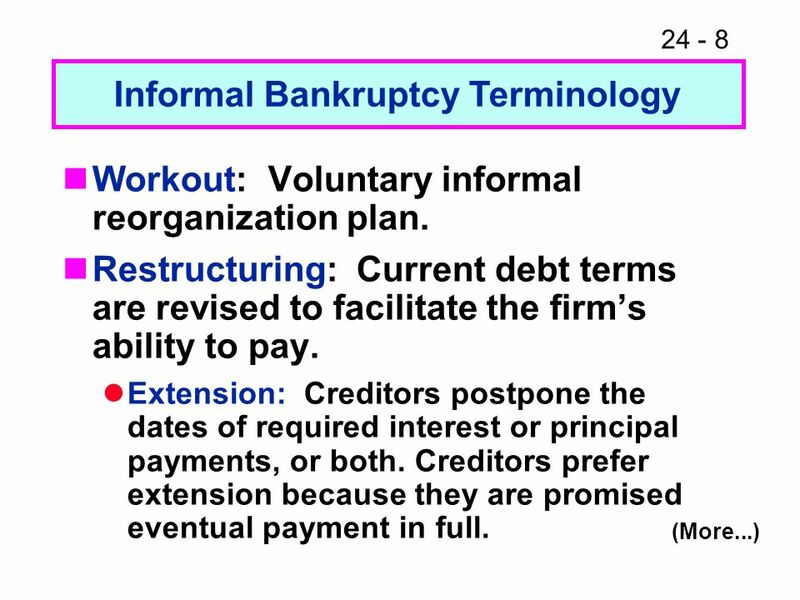 Executive Summary This chapter discusses financial distress, private workouts, and bankruptcy. A firm that defaults on a required payment may be forced.